18k yellow gold bracelet, c. mid - late nineteenth century. Available at our 47th St. Shop! Archaeologically-inspired jewelry was incredibly trendy during the Victorian era, and this bangle is no exception. A look through some the collections at the MET reveals some ancient jewels that surely influenced the unknown designer of our nineteenth-century piece. Gold & Copper Alloy Bracelet w/ Lion-Head Finials. Cypriot, 5th Century BC. Metropolitan Museum of Art, 74.51.3559. 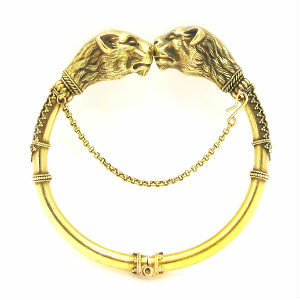 Silver Bracelet with Gold Lion Head Finials. Greek, 5th - 4th Century BCE. Metropolitan Museum of Art, 30.115.86. Some things really never go out of style.